Ramadan has started and hundreds of thousands of Muslims around the UK are spending their day in contemplation, abstaining, where possible, from eating or drinking. The days are long, the heat oppressive but it’s a way of life. To accompany the start of Ramadan, the BBC aired an informative piece on Muslim footballers. Sadly such an interesting show was presented by Colin Murray, but at least Islam was considered favourably. The goodwill extended with Channel 4 airing A Very British Ramadan. A look at everyday Muslims going about their normal lives in the middle of Ramadan. No need to stoke fires by mentioning terror, fundamentalism or fear, an accompanying theme to many stories about Islam. Sadly as the week progressed, as Ramadan started, the anti-Muslim feeling sparked. 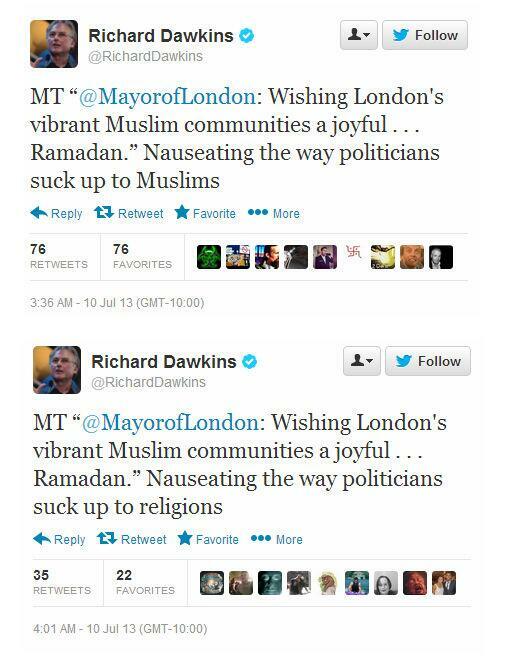 Richard Dawkins decided to wade in, apoplectic with rage at people daring to offer their kind thoughts on Ramadan. The irony is that whilst people like Obama wish all the best to Muslims partaking in Ramadan, their policies and prejudices put Muslims at such risk all over the world. Let’s not ignore the drones Obama sanctions, which kill countless, or his now well known Gitmo strategy of force feeding Muslim inmates at night “out of respect to their faith”. If that is proof of an overwhelming governmental bias in favour of Islam I dread to think what a crackdown would feel like. Note how Richard changes from Religion to Muslims, and ask him how he is not Islamophobic or how he spreads and revels in Islamophobia. A side note, Anjem Choudary, a former solicitor so one assumes a somewhat educated individual, gets stick (rightly) for being an absolute fool. Richard Dawkins, an academic, however, enjoys free unchecked reign to spread his own brand of hate. When will print media take him to task on his nonsense? Or is nonsense only spawned by wild eyed bearded Muslims? Boris Johnson’s comments at the World Islamic Economic Forum in London this week were reported in various media sources but the topic ignored the clear anti-Muslim sentiment. Johnson clearly of the view that Muslim women only ever take proactive steps with their personal lives because “they have got to find men to marry”. The sexist nonsense was rightly rounded upon but the racist undertone has almost gone unnoticed. Both deserve greater media air time, not only to show the shocking intolerance faced by Muslims in the UK but to force the powers that be to act, before events escalate (which as you all know has already happened). A former BNP candidate targets mosques, is jailed, and yet there’s no public reaction? Look at that headline – What a spectacular non-story. Why has the Mail published this with such glee? The anti-Muslim sentiment they both spread and profit from. All the goodwill mentioned earlier, all the positive and heart-warming stories, all done away because the Mail decides that a positive piece about Islam is too much, and focuses on a singular story from Portsmouth where one pupil *felt* he could not drink water. This is not journalism; it’s the most casual of bigotry and prejudices playing out. And let me end this round up by telling you something you already know, thanks to the magic of social media, but which the tabloid newspapers do not deem newsworthy. A building was bombed in Tipton yesterday. Read this by Assed Baig, Suspected Nail Bomb at Mosque in Tipton, for a summary of what happened. 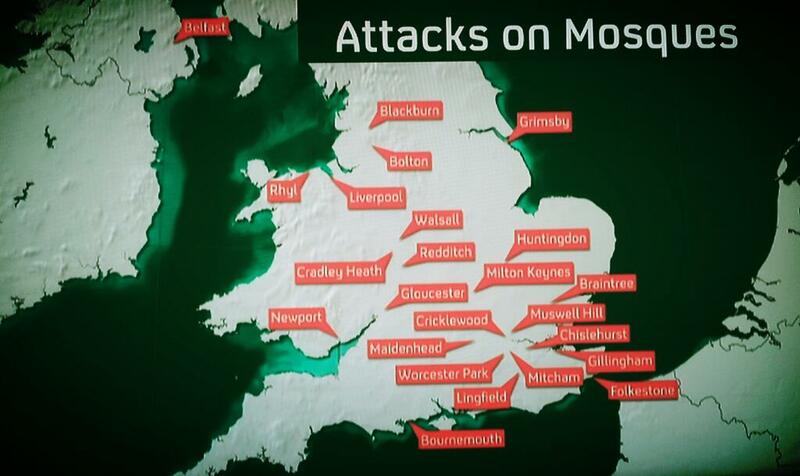 Add it to the list of countless other mosques which have faced attacks over the last month. Was Cobra called? Did news reporters rushed to the scene? Are the front pages of newspapers covering the story? BOMB ATTACK IN UK or TERRORIST STRIKES MAINLAND BRITAIN? When the victims or the targets are Muslims and when he perpetrator(s) are *of a Caucasian appearance* the newspapers do not get involved. Regional papers have covered the story – Tipton nail bomb could have hit hundreds – and yet the national papers which report on issues such as RAMADAN 3AM PRAYER CALL (on the front page in the case of the Sun) finds no space to report this horrific attack. It’s sheer luck that people weren’t injured or killed in this attack. What’s the fallout? People seem convinced it’s an “inside job”. Because Muslims have nothing better than to build bombs and attack each other. It’s a myth spread by the fact that all terrorists the media focuses on happen to be Muslim. In the west the public cannot see terrorism without associating it with a brown bearded man. Western standards dictate that terrorism is a sole Islamic mentality; westerners lap it up and spread the stereotype. Yesterday a bomb attack hit the UK and today the media aren’t reporting on it. Print media have much to answer for. I’m going to be kind for now because I am in negotiation with the PCC. The Commission is struggling with the concept. Seemingly it is not allowed to sit down over coffee and meet its opposition face to face. The PCC needs to initiate a process where the subject can be discussed on a no blame, no fault basis. It needs to be proactive but seems only to be able to cope with reaction. One problem is that media types are “never” wrong. They are not comfortable with challenge.